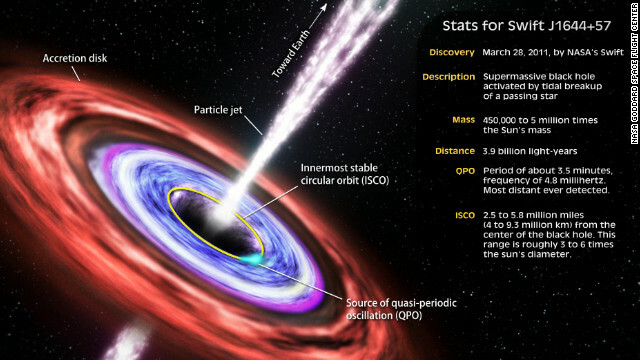 (CNN) – Think of this: you’re an astronomer, and you and your team have detected, for the first time, a star being devoured by a supermassive black hole almost four billion light years away. This is the first time astronomers have captured this drama happening so long ago – and so far away – with a black hole this large. So, you’re the astronomer – and your team sees this by scanning and crunching a pile of numbers. Fine. But how do you get this across to the REST of us? The astronomer we’re talking about is Jon Miller at the University of Michigan. He figured – what if we describe what it would SOUND like? So he and his team translated the frequency of the signals they captured in all those numbers into a sound. Listen to find out how. This is amazing! A star being devoured by a supermassive black hole almost four billion light years away! What a blast from the past! If only we can "see" our world four billion years in the past from four billion light years away. Even things going on just a thousand light years away from Earth that we see through telescopes, we have no idea what's going on over there at this present day and time. ... the irony of looking at things out in space.